My double batch of soup. I used mostly cauliflower and broccoli with a little asparagus and turnip thrown in for good measure. I prefer to use two pots rather than try to cram everything into one pot. Eating primal is not always very convenient. It is easy to get caught in a situation where you walk in the door, hungry, and realize there’s not much to eat that doesn’t require a lot of preparation. Sometimes I don’t mind spending 20 or 30 minutes making lunch, but there are a lot of other days when there’s something else I’d rather be doing. Traditional sandwiches are out of the question and I have yet to find anything that is easy to just have on hand as a primal bread substitute. Soup makes a convenient, satisfying meal. I’ve noticed, however, that canned, store-bought soups are almost never primal as they tend to have beans, rice, pasta, or sugar in them. After pureeing, I combined the soup into one pot. I finished my soup with cream but coconut milk also works well. Several weeks ago my mom brought me 5 or 6 small containers of frozen homemade soup. I’ve been eating them as late dinners when I get home from class, or as a quick, convenient lunch on busy days. I don’t usually make a lot of soup in the summer but these little containers have come in so handy that when I ran out I decided to make some more. I made a double batch so I’d have a lot of leftovers for the freezer. Now I don’t need to worry about being caught without something easy to eat. 1. You can use almost any vegetable you have laying around including the remaining bits of several. Note, however, that if you mix an orange vegetable, such as carrot or squash, with a green vegetable youll end up with a brown soup. It will taste great but might not look so appealing. 3. Can be paired with any protein. You can even just throw some meat in the bowl after you re-heat it for a hearty meal. 4. Quality ingredients make this simple soup taste awesome! 5. Lots and lots of veggies in this soup – very filling, nutritious, and satisfying. 6. A pretty good sized portion only has about 120-150 calories, depending on what vegetables you use and if you use half and half instead of coconut milk… if you care about that sort of thing. 1 lbs vegetables, chopped – mix and match, if you like, or stick to a single vegetable. Some ideas are: broccoli, cauliflower, asparagus, carrot, squash, peas, mushrooms, kohlrabi, turnips, beets. Sautee the onion with the oil in a large pot on medium-low heat for 10 minutes, covered, until softened. Add garlic and stir until fragrant. Add sherry or white wine and cook approximately 1 minute until mostly absorbed. 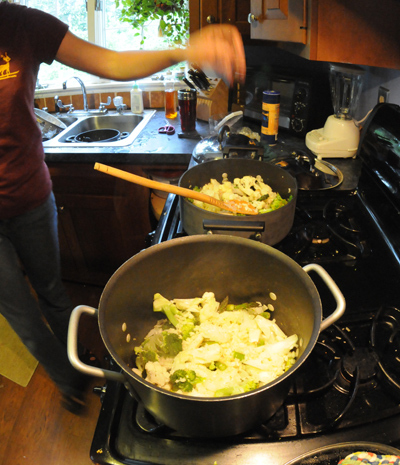 Add vegetables and broth, bring to a boil, reduce heat, cover, and cook 10 minutes more, until vegetables are tender. Puree in batches until smooth, and return to a clean pot. Add half and half, salt, pepper, and nutmeg. Heat until warm but not boiling and serve. Alternatively, allow to cool, transfer to containers and freeze. 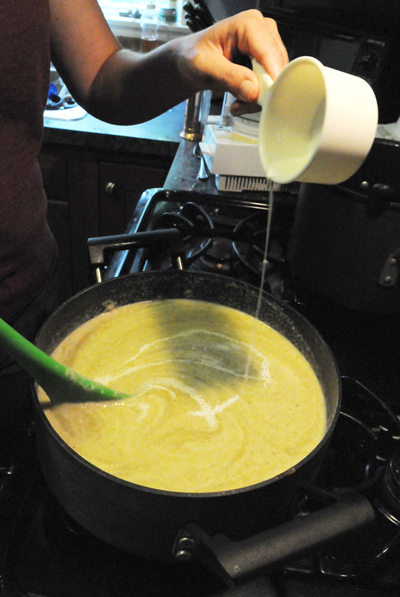 To reheat the soup, run hot water over the container to loosen the soup from the sides of the container. Heat the soup in a saucepan over medium-low heat until it becomes mostly liquid. Then increase the heat until hot, but not boiling. Awesome recipe! Tried it last weekend. I did combine some orange and green veggies so it wasn’t the prettiest color but taste was great!! Good way to use a up tons of veggies before they go bad. Thanks for that, and for any readers that are having trouble chopping onions without the tears, here’s an incredibly easy tip – put them in the fridge first, then chop them straight away after taking them out! No more tears! I found some more onion soup recipes here if anyone wants to try some more recipes.